Now you can have your tractor and your zero-turn too. Toro’s innovative TimeCutter SW mowers are the perfect blend of both. You get the controls and side hill stability of a tractor with the manoeuvrability and time savings of a zero-turn mower. 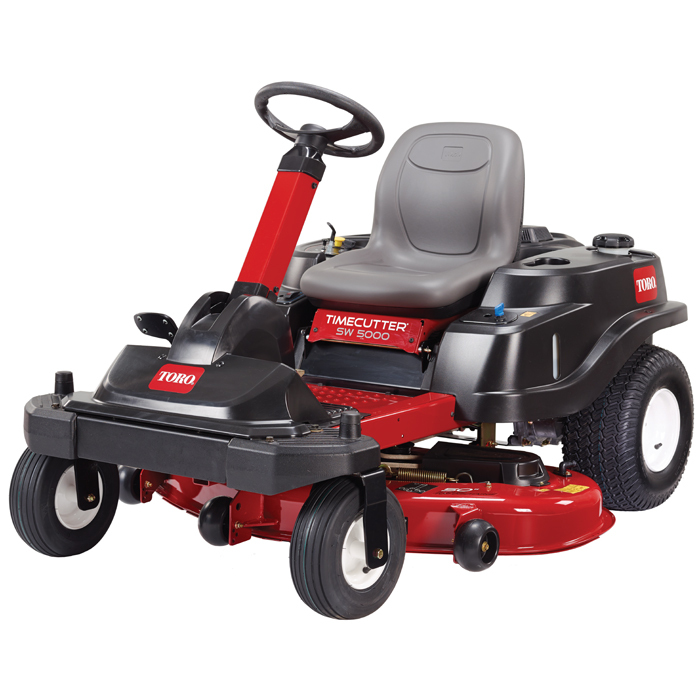 The TimeCutter SW5000 50" (127 cm) 18.27 kW (24.5 hp) Toro V-Twin 708 cc with Self-Cleaning Air Filtration System Zero-Turn Riding Mower has a 3-blade mowing system under a 10.2 cm deep, top discharge deck design with convenient washout port. The mower boasts 7 cutting positions between 3.8 cm and 11.4 cm in height. Toro V-Twin ZX Series Engine - The 18.27 kW (24.5 hp) Toro V-Twin engine was specifically created to deliver optimal performance in our mowers by matching the torque curve of the engine to the needs of the Toro decks it powers. The engines feature a patent-pending self cleaning air filtration system to keep dirt away from the air filter for longer life and higher performance. With heavy-duty components and innovative features, it’s the perfect match for the job you need to do. Heavy Duty Rear Engine Guard - This heavy duty steel guard protects the engine from branches and debris as you nimbly manoeuver around your lawn. 11.4 L fuel capacity - All TimeCutter riding mowers feature a large 11.4 litre fuel tank for more mowing with fewer fill-ups. Knowing when to fill up is simple thanks to the translucent tank, which also helps to prevent overfilling. 50" (127 cm) Mowing Deck - Toro’s 10.2 cm deep, top discharge deck design provides superior cutting performance in all conditions. Anti-scalp wheels allow the deck to float over the turf and reduce scalping. Create your own natural fertiliser by adding a Recycler® kit or make garden clean-up a snap with an optional Twin Bagging system. Heavy-Duty 10 Gauge Uni-body Steel Frame - The lower the gauge, the thicker the metal, that is why we use heavy duty 10 gauge steel. The uni-body steel frame provides the optimal balance in rigidity and flexibility for quick, highly manoeuvrable mowing conditions. Hitch Kit Standard - Hitch kit comes standard on all TimeCutter models. It’s easy to increase the versatility of your zero turn mower by attaching a dump cart, de-thatcher, fertilizer spreader or other Brinly-Hardy attachments. Dual Hydrostatic Drive System - Independent hydrostatic drive systems provide responsive manoeuvrability and zero turning capabilities. These independent drives are anchored to Toro’s unibody frame and reinforced with a cross member for lasting durability and performance. Smart Park™ Braking System - Toro’s unique braking system automatically stops the mower deck and sets the parking brake when you need to get off the mower while keeping the engine running. Save on Average 45% of your MowingTime - The Toro TimeCutter cuts your mowing time almost in half, which means less work for you and your mower. You’ll not only have more time to enjoy, you’ll extend the working life of your mower. Non-Slip, Easy-to-Clean Floor Pan - The pierced floor pan is perfect for homeowners who like their mower to look as nice as their lawn. Simply hose down the floor pan after each use and keep your TimeCutter looking as good as new. The non-slip pierced extrusions also provide an additional measure of safety. Key Choice™ Mowing System - Remove the key to prevent others from mowing in reverse for added piece of mind.